For this post, before we get into the more esoteric issues of ebook design and publishing, I’d like to start by defining the subject: just what is an ebook? This may sound like a very simple question to answer, but it isn’t as straightforward as you might think, and being able to answer it correctly will make many of the thornier issues of creating ebooks just a bit easier. 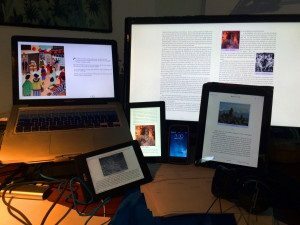 If I were to ask most folks to answer that question they’d probably say that an ebook is a digital file for reading text on a digital device — a computer, tablet, or smart phone. And that answer would be true, so far as it went. Unfortunately, that definition would cover a wide variety of documents that aren’t ebooks. A Microsoft Word file, for example, is a great way to compose and share formatted text — heck, you can even add images and hyperlinks, just like an ebook. Word docs, however, are by definition meant for writing and editing the text, not for distributing it commercially. We don’t want our readers rewriting sections of our books without our permission, do we? If they don’t like what we’ve written, fine; they can write their own books! A kind of digital file that is frequently referred to as an ebook but that isn’t is the PDF — the now-universal Portable Digital File format that Adobe invented as a way of distributing print documents digitally. Not only is it how we share our own personal documents (letters, etc.) through the internet, but it’s how publishers have been transferring print-ready files to commercial printers for decades. How is that not an ebook, you ask? The PDF isn’t truly an ebook because it retains its format no matter the size of the screen that displays it. It will always be an accurate representation of the paper document that it represents — on a 27″ monitor, on a 13″ laptop display, on an 9.7″ iPad screen, or a 4.8″ Galaxy s3 phone. The basic unit for a PDF is the page. And so as the screen shrinks, so does the page size, and with it the size of the words, and with them both the readability. Anyone who’s tried to read a PDF on a small screen knows what I mean. Images will resize (if the book has been properly designed) to the proportions of the screen. Ideally the book will be attractive and easy to read on any device — and because each software application for reading ebooks has some reader controls, some whose vision is no longer as strong as it once was (like, say, me) can make it larger, while someone who doesn’t like serif fonts can have the book display in sans-serif or, heck, Zapfino (don’t try this at home). And this can all be done without changing the ebook itself — the changes are simply user preferences within the app. Now, there’s another kind of file that is meant to do very much the same thing — and you’re looking at one right now. Web pages provide exactly the flexibility that ebooks require. And so when the International Digital Publishing Forum (IDPF) started looking at trying to create a new ebook standard over a decade ago, they looked to the language of the Web — HTML — as a basic building block. And the ePub file itself is nothing more than a self-contained package containing a group of HTML files, with its own set of styles for formatting and a navigation document (or two) for making sure everything gets displayed in the right order. And that is what an ebook is: a website in a box. Next time, I’ll talk about what that actually means. 1 This leads to some really fun exchanges between ebook designers and their clients. I love getting lists of notes from clients saying that a particular problem shows up on “page 23.” I have to point out to them that page 23 on their laptop may be page 12 on my big monitor or page 124 on my phone. 2 Okay, that’s a bit of a simplification: Amazon’s so-called KF8 format that you may have heard of is in fact a variation on the ePub standard, as are the AZW3 files that you may have loaded into your Kindle or Kindle app (but not simple AZW files, which are just mobi files with digital rights management attached). KF8 files are a kind of Frankenstein monster with an ePub file to load onto newer Kindles and Kindle apps and an old mobi file to load onto older Kindles. Still: there’s ePub in there! David Kudler is a Contributing Writer for TheBookDesigner.com. He is also an author, an editor, an ebook designer and a writer for the Huffington Post. You can learn more about David here. If I follow this discussion, it sounds to me that a PDF version of the book would therefore use the same ISBN as the printed version. I had planned to print copies of my PDF 12 page book and was hoping not to have to get another ISBN. My understanding is that every version needs its own ISBN so this was a question that I had been pondering. Very informative post. I have a question regarding a previous blog of yours, “The 6 things you should be including in your ebook.” I am hoping you can help with a problem I’m having when I put a link in my ebook to take the reader to the Amazon review page for my book (the link works from my desktop) when accessed from my Kindle the link goes to an Amazon page that does not have the “review” button for readers to write a review. Is there a solution to this problem? Nancy, I’m so sorry that I didn’t see either this comment or the other on the social links post. I’m going to answer that question over there, okay? If you judge a PDF file is not an ebook because of this, then “fixed-layout” EPUB and KF8 are no eBook either because they retain format no matter the size of the screen that displays it. Your point is well-taken. Thanks for bringing that up! Here’s the difference between fixed-format ePub (of which fixed-format KF8 is a variant) and PDF: by swapping out the style sheet, deleting one file, and making a couple of clearly defined changes to the HTML, I can have a reflowable ebook. If the original file was put together correctly, I can do that in an hour. To do the same with a PDF, I have to do a complete conversion, either from the source file, or from the PDF itself, which can take much, much longer. Add to that the scriptability of the ePub format (the ability to add widgets that pull data from the Internet or keep track of reader choices, to add a read-aloud track, say), and while fixed-format ebooks may look like PDFs, they aren’t the same thing. Adobe, I and much of the world think that PDF stands for Portable Document Format. I agree. Some books, particularly textbooks and cookbooks, need to retain their precise formatting no matter what device they’re displayed on. I consider PDF a poor way to do that, but that doesn’t mean that the result isn’t a ebook. Michael, thank you for the correction; I thought I’d double-checked that, and I’m glad you caught that. I will stand by what I said (at least about the file format): PDF is fabulous, but it is a representation of a print format. Even when compared to fixed-format ebooks (see my response to John above), it is inflexible, less interactive, and difficult to convert to a reflowable ebook without a lot of work. Absolutely, there are types of books that are better served by a fixed format. I just don’t think that PDFs serve that purpose as well. KF8 sticks with the PDB format for packaging but brings Amazon’s display format to more or less feature parity with EPUB. It is absolutely incorrect to say that a KF8 file contains an EPUB file. Amazon’s tools can take an EPUB file as input and generate a KF8 file, but that is a transformation. While Calibre (an open source tool) can construct a valid EPUB (most of the time) from a KF8 file, that is another transformation. It is no different from tools that turn an HTML file into a Word document and vice versa.